A British company is selling British air to China for £80 per tub - with absolutely no regard for what happens when we run out. With air pollution rampant in China, and China being extremely rich, it was only a matter of time before they started shipping in fresh imported air from elsewhere. And now a British guy in a flatcap, Leo De Watts, has made thousands of pounds selling tubs of air to Chinese buyers. His company, Aethaer, has bagged air from Dorset, Somerset and Wales since launching last year, and have sold a lot of air to pollution rich cities such as Shanghai and Beijing. Leo, 27, has put no thought whatsoever what happens when we run out of air, and have to walk around in scuba gear when we want to go to the f*cking bank. The team get up at 5am to harvest the air, he claims in the above video, using large nets. They then move the air into pint sized jars to be shipped abroad for £80 a pop. Setting off with a car full of empty jars at 5 a.m., the team "harvests" air in large nets and seals it in the glass jars before shipping it across the world. The company has made a lot of money, according to their own website, and earn more money by collecting bespoke air from different parts of the UK. "Quite often a lot of our orders are bespoke -- we have clients who request very particular circumstances for their air"
"Sometimes we'll be at the top of a mountain, other times the bottom of a valley." Surprisingly, this isn't the first time someone has had the idea of shipping air around in tubs. You can get air at a much more reasonable price of £1 per pot from another seller. The only catch? It's from the north. Do you miss the smell of northern air? The fresh scent of the wind as it rushes past coal miners? The feel of someone saying "t" instead of "the" as it brushes through your hair? 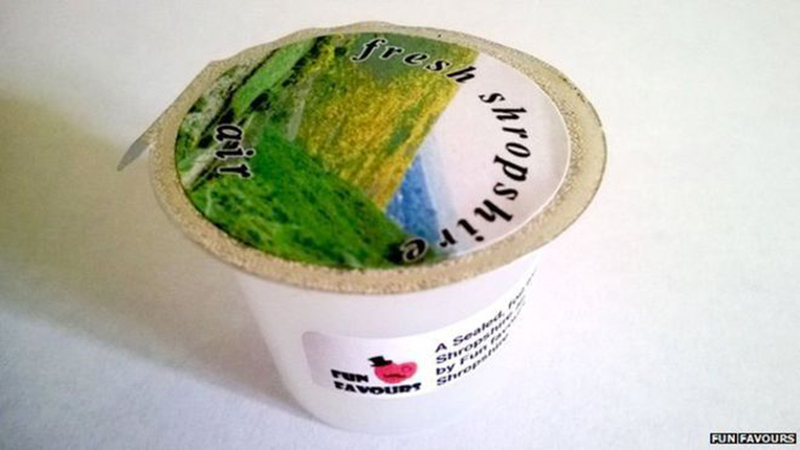 Miss it no more: You can now buy pots of northern air for £1 per pot. Last year another company started selling northern air. The air, mined and sealed in a garden in Bridgnorth, Lancashire, are on sale on eBay. So if you're a northerner who misses the smell of back home, or just a Londoner who wonders what "no pollution" feels like in your lungs, you can get some within a matter of days. So if you're reading this trapped in an air-tight container in some sort of James Bond scenario and were thinking of ordering some, don't bother. You'll be long dead by the time it arrives. We wish you luck. The most expensive air ever sold?